Big box office supply chain Staples has announced plans to trim 15 percent, about 30 stores, of its brick and mortar retail space. It seems the company has experienced a steady decline in sales (i.e. 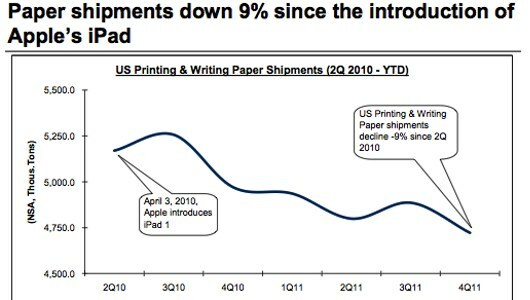 the 9 percent decline, chart below, in papers sales since 2010) and the driver of the trend is Apple’s iPad. This is a cloud- and tablet-based and paper-free world. We’re already there, and all those trends are only going to get bigger. You don’t need a highlighter for anything on an iPad. You don’t need a 3M Co. Post-it for your iPhone. Five years from now, I predict that copier sales will be a fraction of what they are today —Cody Willard, MarketWatch. The paper industry is a major employer here in the US and abroad. However, with global warming on the rise, few will lament the fact that fewer trees are cut down to feed office printers and copy machines. That said, my family’s trusty Kodak 5300 AIO recently stopped working and we have no plans to replace it. With a houseful of iThings — iPhone, iPad, iPod touches, as well as Macs — we really don’t need to. 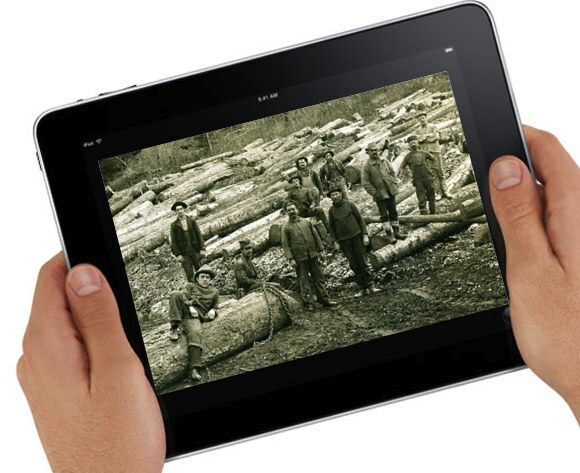 Has the iPad reduced your printing and office supply needs?